For as long as I can remember, I’ve been inspired by animations. Something about the storytelling, the artwork, and the fact that these movies were drawn by hand and translated into something incredible got me excited. One of my favorite animators is Hiyao Miyazaki, the man behind the Japanese animations like My Neighbor Totoro and Princess Mononoke. 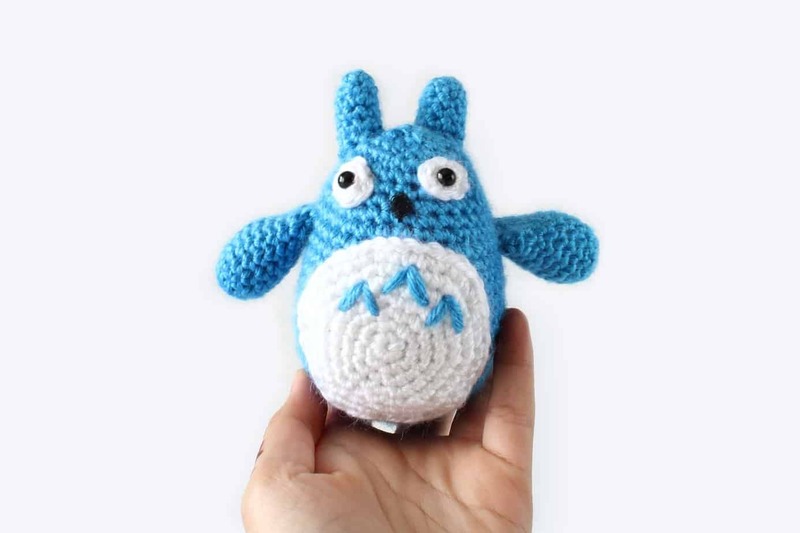 Today, I wanted to recreate the 3 Totoro from the movie as crochet amigurumis. 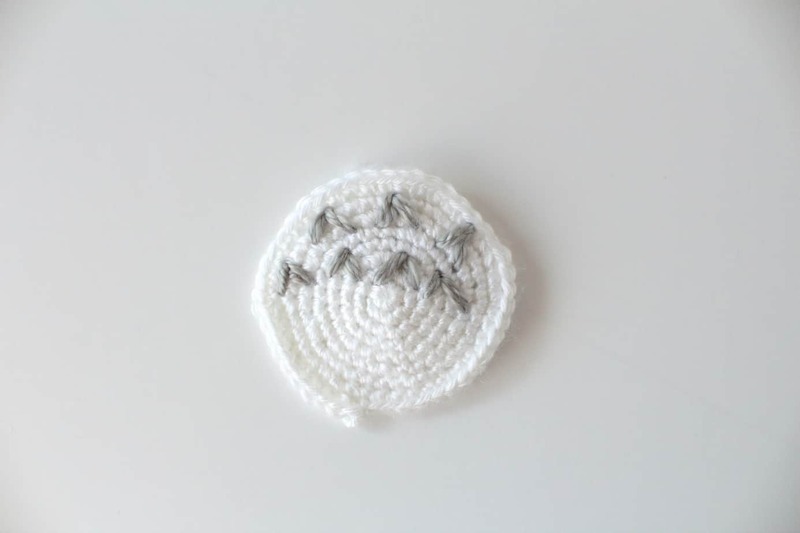 This is a really easy pattern, perfect for beginners, so let’s get started! 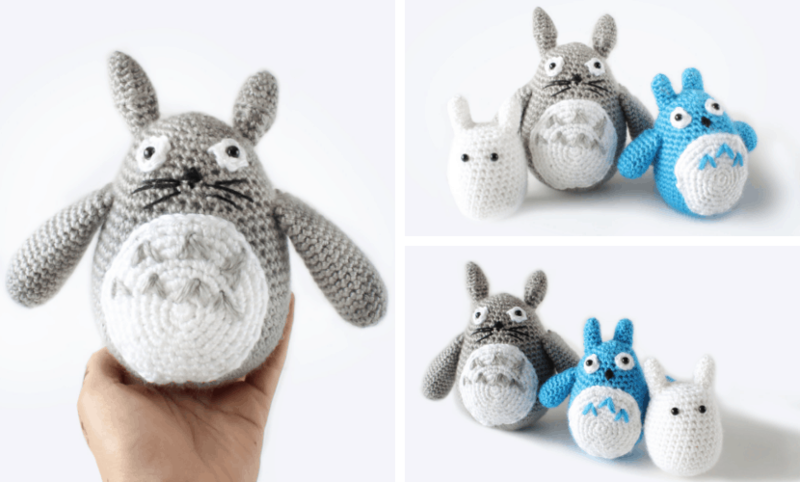 So… What is a Totoro? Basically, it’s a nature spirit. 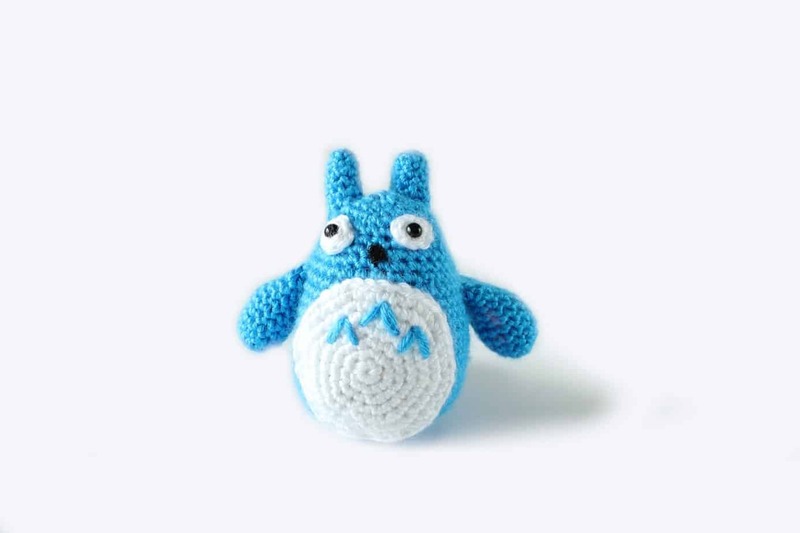 The character itself is Miyazaki’s creation, but it’s rooted in Japanese culture as a troll and the combination of a few animals. 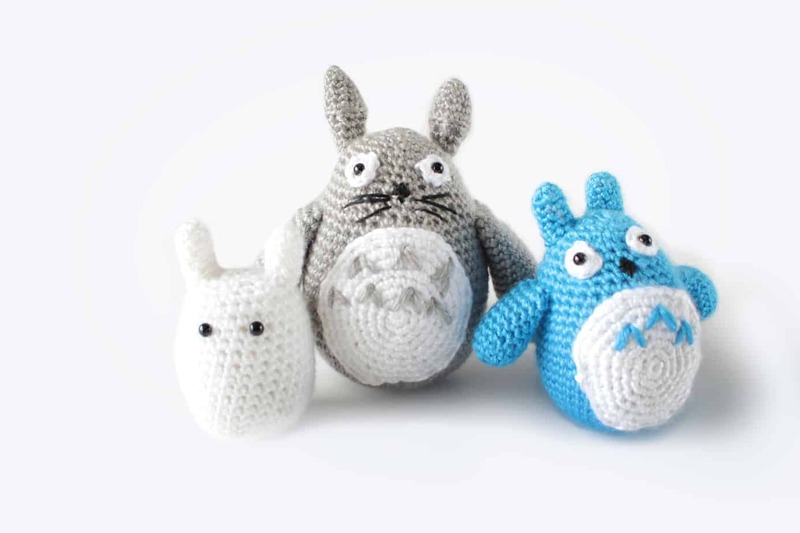 In the movie, there are 3 totoro that Mei meets and explores the forest with, so we’re going to make all three today. 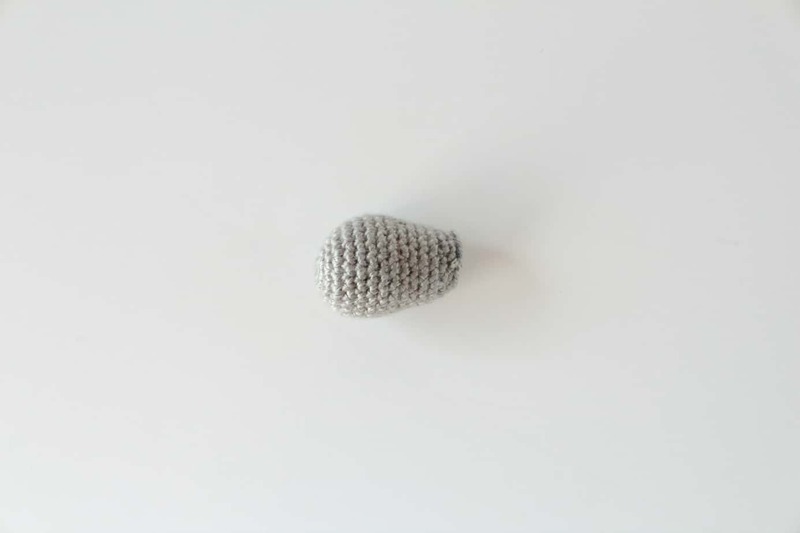 For this crochet pattern, I’ll be using Caron Simply Soft yarn. It’s a #4 worsted weight acrylic yarn that’s super soft and comes in a ton of colors. I normally use Yarn Bee’s Soft Secret for my amigurumi, but as it’s a Hobby Lobby brand, it’s difficult for some people to find. The Caron yarn is exactly the same, and there’s a huge range of colors you can pick out at a Joann’s or directly from Yarnspirations. The yarn is machine washable and has a pretty sheen that keeps your projects looking new. I love how the yarn works with my amigurumi – the tight stitches old well and don’t split, and I can get really picky with colors! Round 1: With white yarn, create a magic loop and work 6 SC into it. Slip stitch to the first space and BO, leaving a long tail. 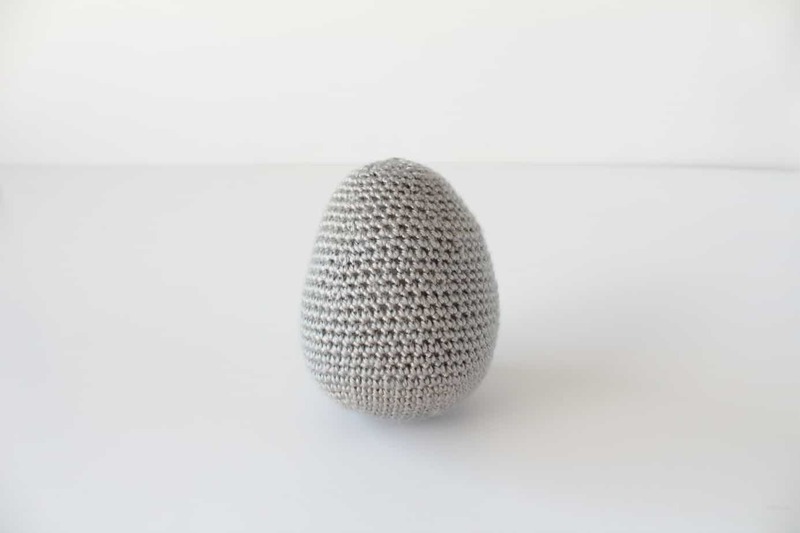 Round 1: With gray yarn, create a magic loop and work 6 SC into it. Use a stitch marker to mark the first stitch. 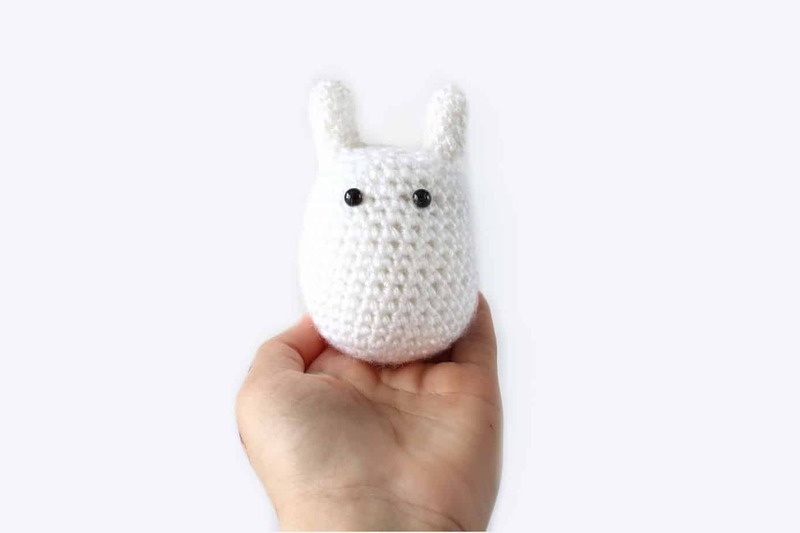 We’ll be working in continuous rounds throughout the amigurumis. Round 2: Increase around by working 2 SC into each space (12). Round 3: *SC 1, increase* around (18). Round 4: *SC 2, increase* around (24). Round 5: *SC 3, increase* around (30). Round 6: *SC 4, increase* around (36). Round 7: *SC 5, increase* around (42). Round 8: *SC 6, increase* around (48). Round 9: *SC 7, increase* around (54). Rounds 10-19: SC around for 10 rounds. Round 20: *SC 7, decrease* around (48). Rounds 21-23: SC around for 3 rounds. Round 24: *SC 6, decrease* around (42). Rounds 25-27: SC around for 3 rounds. Start to add the stuffing to the body now. You want to fill it so it’s firm but not overfill and stretch out the stitches. Round 28: *SC 5, decrease* around (36). Rounds 29-31: SC around for 3 rounds. Round 32: *SC 4, decrease* around (30). Rounds 33-35: SC around for 3 rounds. Round 36: *SC 3, decrease* around (24). Round 37: *SC 2, decrease* around (18). Insert your safety eyes through the center of the whites and align them on the body. Once you’re happy with the placement, secure the back of the eye. Then finish adding the stuffing to the body. Round 38: *SC 1, decrease* around (12). Round 39: Decrease around (6). Cut the yarn and thread the end through a tapestry needle. Then bring the needle under the front loops of the remaining 6 stitches and pull to close. Secure the yarn and weave in the end. Round 1: With gray, create a magic loop and work 4 SC into it. Round 2: Increase into each space (8). Round 4: *SC 3, increase* twice (10). Round 5: *SC 4, increase* twice (12). Round 6: Decrease around (6). Rounds 7-9: SC around for 3 rounds. BO and leave a long tail for sewing the ears onto the Totoro. Lightly add stuffing to each ear. Round 1: With gray yarn, create a magic loop and work 6 SC into it. Round 2: Increase round by working 2 SC into each space (12). Rounds 5-9: SC around for 5 rounds. Round 10: *SC 3, decrease* around (24). Round 11: *SC 2, decrease* around (18). Rounds 12-14: SC around for 3 rounds. Round 15: *SC 1, decrease* around (12). Round 16: SC around and BO, leaving a long tail for sewing it onto the body. Lightly add stuffing to the tail. Round 1: With white yarn, create a magic loop and work 6 SC into it. Round 9: *SC 7, increase* around (54). BO, and leave a long tail for sewing it onto the body. Cut a length of gray yarn about 12″ long and thread it through a tapestry needle. With simple straight stitches, embroidery on the arrow ^ shape on the belly. The large Totoro has seven of these chevrons. Then secure the yarn and trim the excess. Rounds 4-18: SC around for 15 rounds, then BO and leave a long tail to sew the arms onto the body. Lightly add stuffing to the arms. 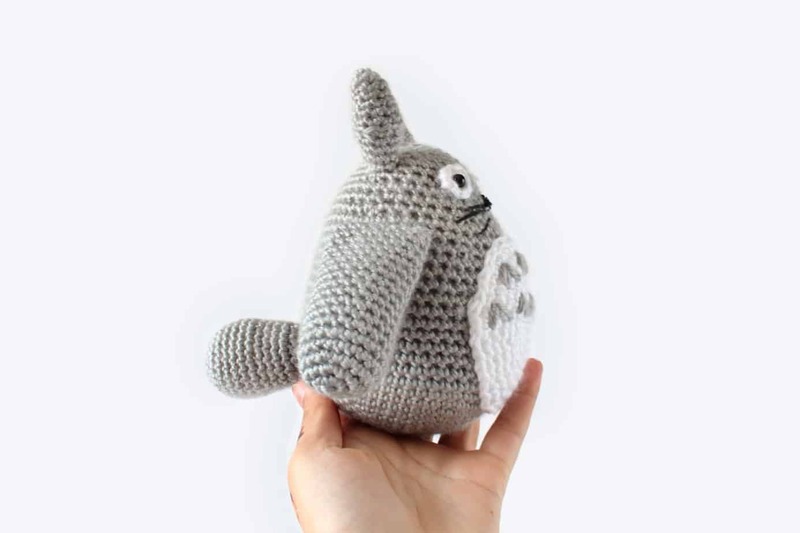 Now that you have all the pieces for your Totoro ready, it’s just a matter of sewing everything together. Generally, I place the limbs where I want them to go and hold them in place with pins. Then, thread the long tails you left through a tapestry needle and go through a space on the limb and a corresponding space on the body. Try to get all the ends on the underside of the limbs and secure the yarn. 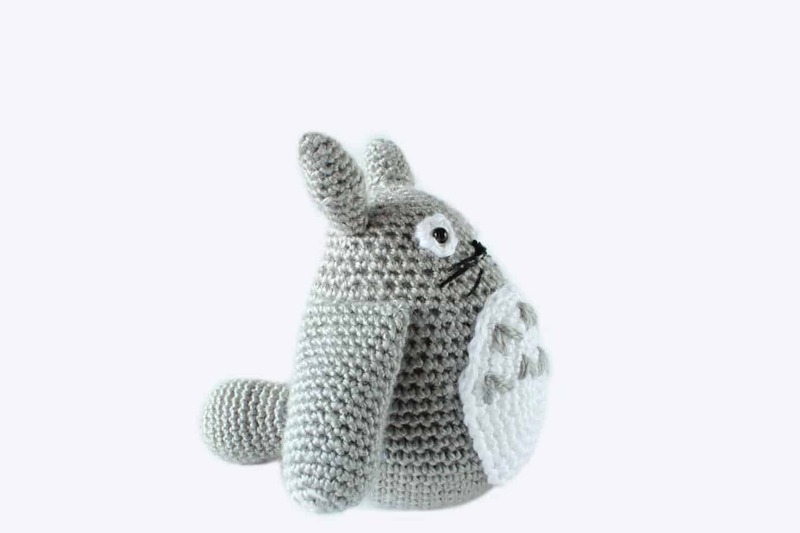 For the tail, position it in a way that helps the Totoro stand and sew around it to secure it. For the belly, I worked around the edge of the piece and worked as much on the white area as I could so my stitches don’t show. I did the eyes the same way. Finally, weave in all the ends and trim the excess yarn to finish. Round 1: With blue yarn, create a magic loop and work 6 SC into it. 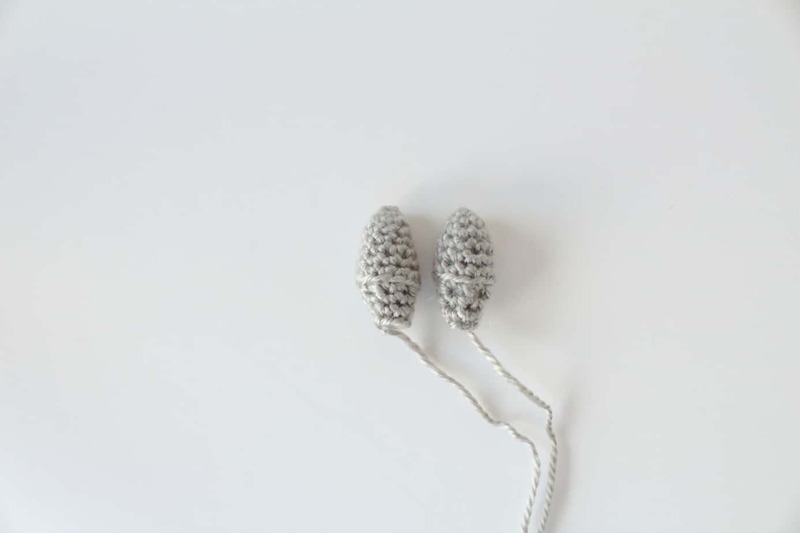 Use a stitch marker to mark the first stitch. 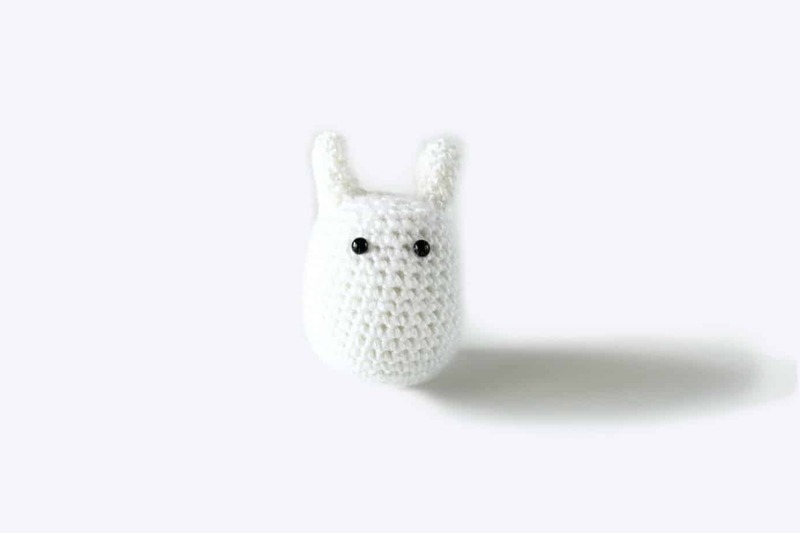 We’ll be working in continuous rounds throughout the amigurumis. Rounds 8-15: SC around for 8 rounds. Round 16: *SC 5, decrease* around (36). Rounds 17-18: SC around for 2 rounds. Round 19: *SC 4, decrease* around (30). Rounds 20-21: SC around for 2 rounds. Round 22: *SC 3, decrease* around (24). Round 23: *SC 2, decrease* around (18). Round 24: *SC 1, decrease* around (12). Round 25: Decrease around (6). Cut the yarn and thread the end through a tapestry needle. Then bring the needle under the front loops of the remaining 6 stitches and pull to close. Secure the yarn and weave in the end. Round 1: With blue, create a magic loop and work 4 SC into it. Round 3-7: SC around for 5 rounds. 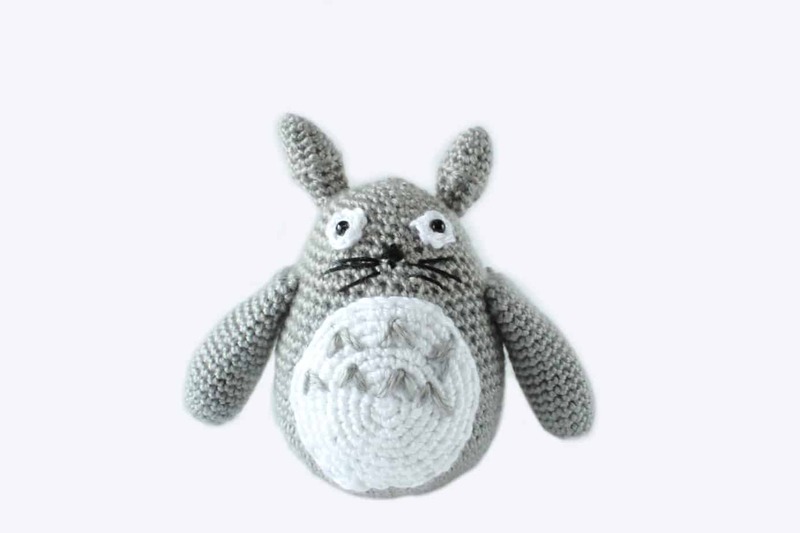 BO and leave a long tail for sewing the ears onto the Totoro. Lightly add stuffing to each ear. Round 1: With blue yarn, create a magic loop and work 6 SC into it. Round 9: *SC 1, decrease* around (12). Round 10: SC around and BO, leaving a long tail for sewing it onto the body. Lightly add stuffing to the tail. Round 7: *SC 5, increase* around (42). 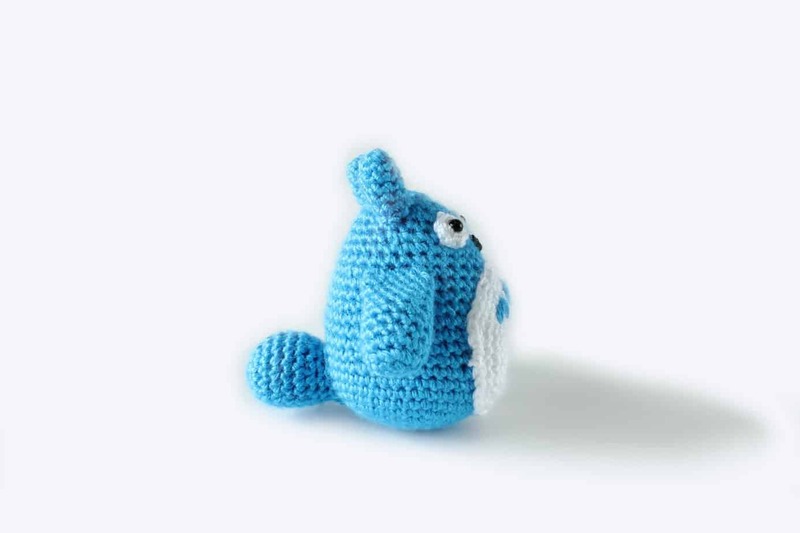 BO, and leave a long tail for sewing it onto the body. Cut a length of blue yarn about 12″ long and thread it through a tapestry needle. With simple straight stitches, embroidery on the arrow ^ shape on the belly. 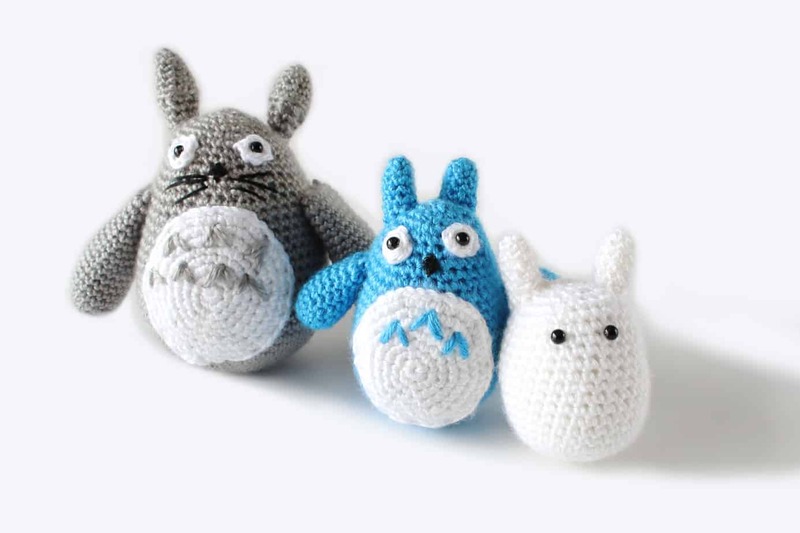 The blue Totoro has 3 of these chevrons. Then secure the yarn and trim the excess. Rounds 3-10: SC around for 8 rounds, then BO and leave a long tail to sew the arms onto the body. Lightly add stuffing to the arms. 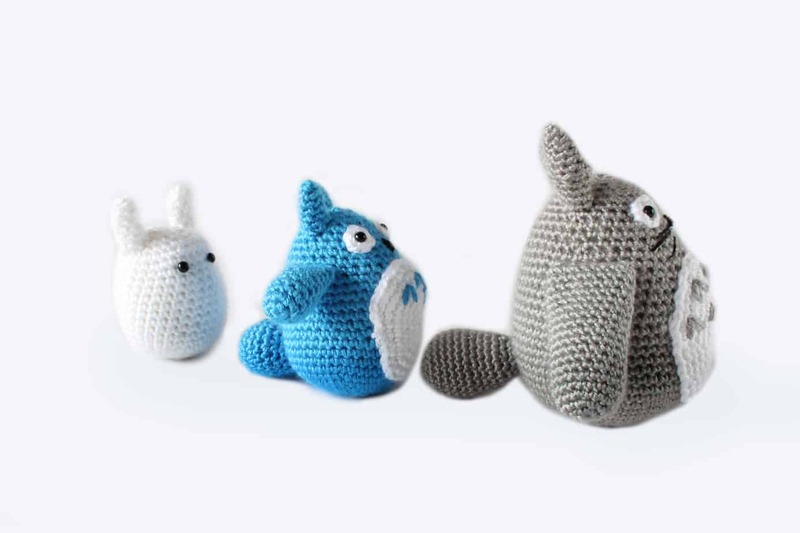 Assemble this blue Totoro the same way as the gray one above. Round 1: With white yarn, create a magic loop and work 6 SC into it. Use a stitch marker to mark the first stitch. 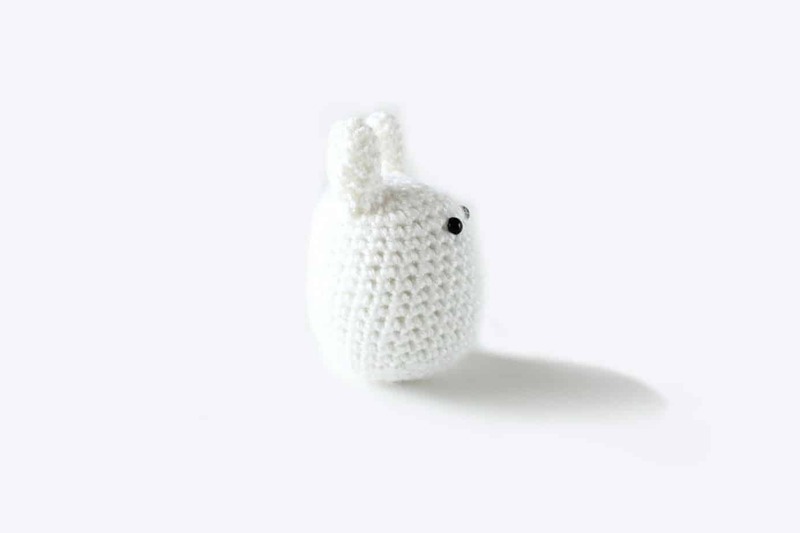 We’ll be working in continuous rounds throughout the amigurumis. Rounds 6-18: SC around for 13 rounds. Round 19: *SC 3, decrease* around (24). Round 20: *SC 2, decrease* around (18). Insert the safety eyes directly to the body, and once you’re happy with the placement, secure the backings. Round 21: *SC 1, decrease* around (12). Round 22: Decrease around (6). Cut the yarn and thread the end through a tapestry needle. Then bring the needle under the front loops of the remaining 6 stitches and pull to close. Secure the yarn and weave in the end. Round 1: With white, create a magic loop and work 4 SC into it. Round 3-6: SC around for 4 rounds. 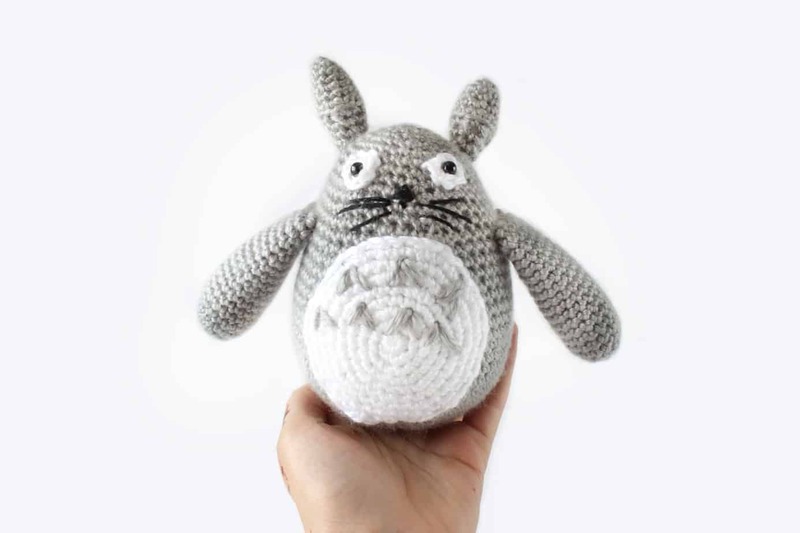 BO and leave a long tail for sewing the ears onto the Totoro. Lightly add stuffing to each ear. 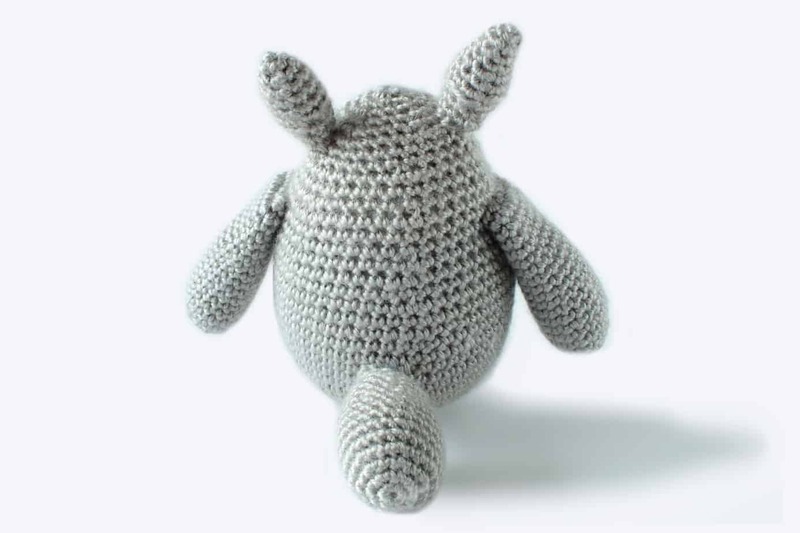 Sew the ears onto the body to finish the smallest totoro. And there you have it! 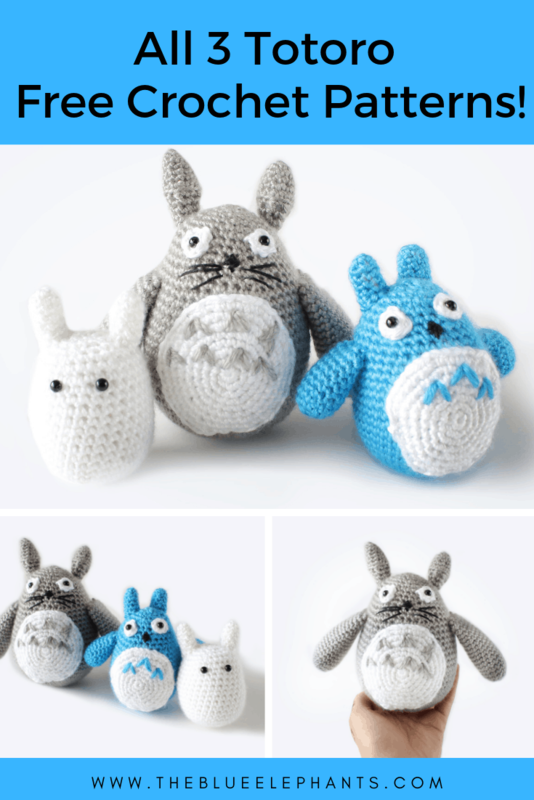 This post is super long but I really wanted to include all three totoros in one post. 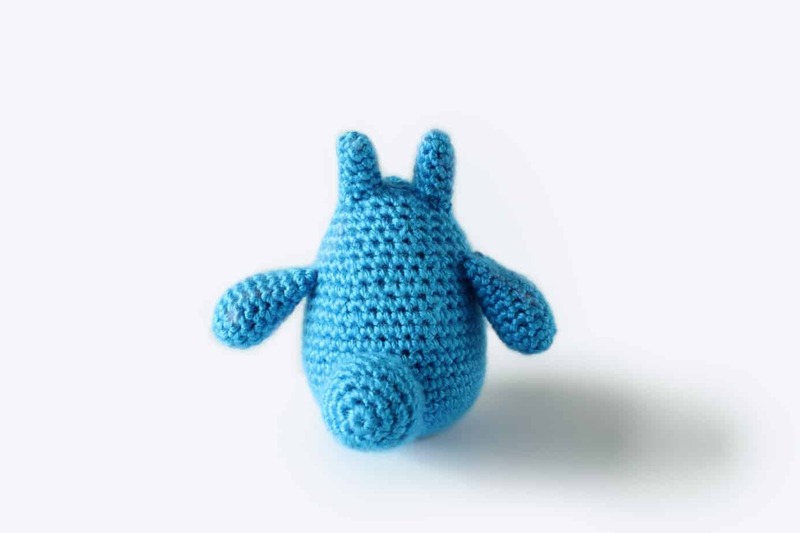 If you want a printable version of this pattern, you can grab it over in my Etsy shop and on Ravelry. This pattern set was so much fun for me to do and I hope you enjoyed it! I love creating plushies and that’s something I will be sharing more of as we move into spring and summer. 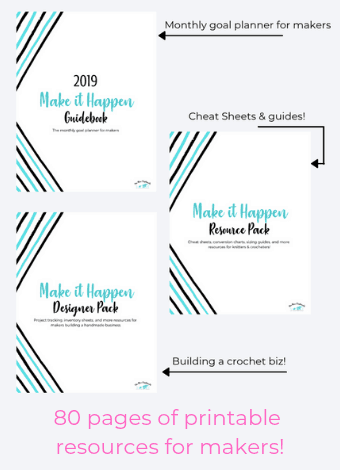 To make sure you don’t miss any of my upcoming patterns and posts, be sure to sign up for the newsletter down below. 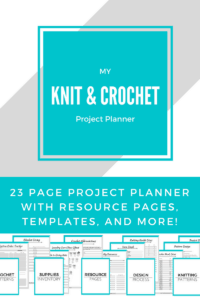 Just enter your name and email and you’ll be signed up to receive weekly newsletters from me about the latest on the blog, freebies, and you get access to the resource library! Super cute! Any anime fan would love these guys! Thanks for sharing on Dishing It & Digging It! Shehla, you did a great job making these characters, and creating the patterns, wow!! These guys are sooooo cute! !